Will happenstance and familiarity ruin their possibility…. 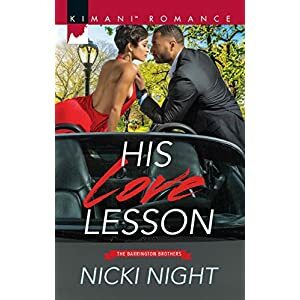 His Love Lesson by Nicki Night is an engaging tale of a woman that makes smell goods and lotions, Chey Rodgers knows exactly what she wants to do and sets out to do just that. First she moved away to the “city” and ending a relationship with a finance that was stifling and judgement. Then she sought out to finish her higher education and obtain work in the industry to gain experience and knowledge but first, she goes on a much desired, snowy vacation. While “vacationing” happenstance and her kindness throws a man in her path that she can’t stop thinking of, after they spend time together. Hunter Barrington, is a corporate attorney has a chance to do something that he always wanted to teach. Based on the outcome of this semester, he could get an appointment. This is jeopardized when a woman that he spent time with when he was snowed on a trip to Utah wounds up in his class. On top of this, he has a colleague that has plans to make them an “us” and uses manipulation and underhandedness to try to achieve such….will she? Read His Love Lesson and see if Hunter and Chey makes it through, well worth the read.